Stay calm, just stay calm. Sometimes that’s easier said than done when you’re raising kids. Kids are great at pushing boundaries and making mistakes. Sometimes what we need are a few good calm down tips to keep us calm when we feel like exploding. It’s true, when we are calm, we can address a situation so much better than when we are angry. So, how do you stay calm? I have come up with 5 calm down categories. I’ll give you a few examples of each, and then at the end of the post, you’ll get a copy of 50 ways to calm down. I hope that this helps you stay calm in the chaos of raising kids! Moving our bodies is a great way to get out some of that anger. Whether it be cleaning your house, going for a walk, or shaking it off, physical movement gets out some of that pent up aggression in healthy ways. 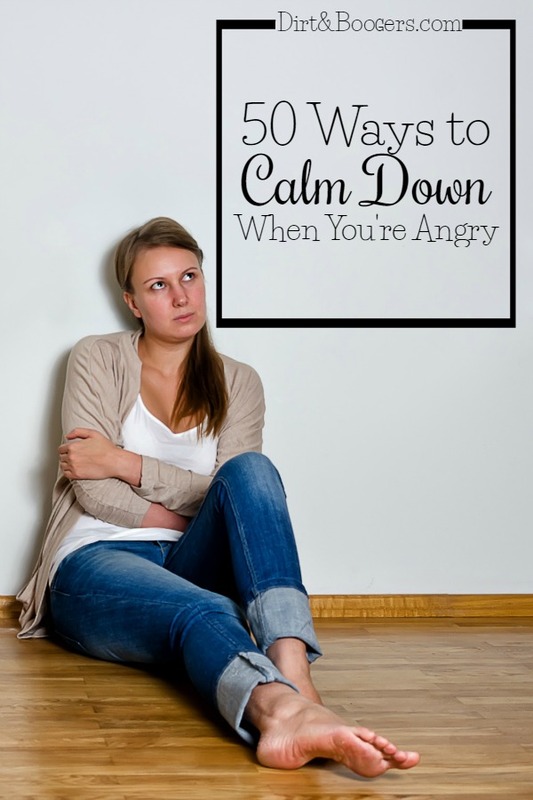 This can help deal with some of that emotional flooding we feel when we get angry. It helps bring your brain functioning to a place of logic instead of it’s primal emotional place. Plus, exercise releases feel good endorphins into your body and is an instant mood lifter. This is by far my favorite way to calm down in the moment. Starting a tickle war, making silly faces, and laughing it off helps change the entire mood of the house. Not only do you calm down, but you get your kids attention and it’s just another great way to connect with them. The power of play is strong and real. I dare you to try this and see for yourself. Sometimes we just need to physically calm down and relax our bodies. Taking hot showers, listening to calming music, or deep breathing can help us relax the anger away. If you don’t get space from your kids to relax, I have a video in my course, Mama’s Anger Management, that gives you 3 easy ways to relax your body…even when kids are around. It’s probably my favorite part of the entire course. When our emotions really bubble up, sometimes the best thing we can do is get it out. Go outside and scream, and if you feel like you need to scream at your kids, scream “I LOVE YOU!” Those 3 words will remind you that you do love your kids, even when you’re angry. Once you get that initial burst of anger out, it’s time to focus and re-access the situation. Going into ranting and raving isn’t always all that helpful, but you can talk it out. I’m a big talker. I mean, I talk ALL day long…mostly to myself. So, when I’m angry I like to talk it out. Now, this does not mean venting and raging. Those things aren’t really all that helpful when it comes to dealing with anger. I mean I make noise. I count out loud, I make the “shhhh” sound, or say a few good mantras to calm me down. I will also talk to a friend about things and get some advice. There are a lot, I mean probably hundreds, of ways to help calm down or to keep us from yelling. 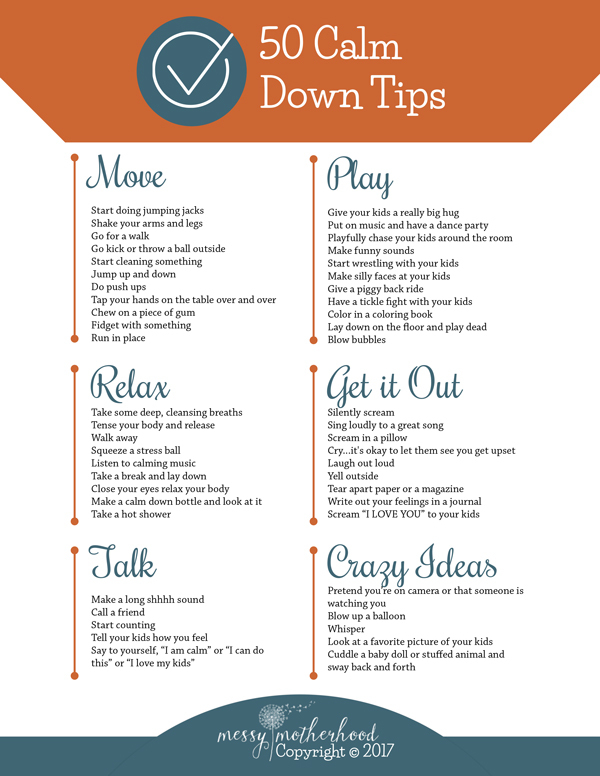 I’ve just compiled 50 of my favorite ways to calm down and put them in a handout just for you. Now, these tips are just the tip of the iceburg. Next, you need to know how to really USE them. To know how and when to use calm down strategies like these, check out my course, Mama’s Anger Management. I have compiled everything I learned as a Mental Health Therapist and as a Mom and put it into a 4-week course just for you. I promise that when you are done with my course, that you will have everything you need to be that calm, happy parent that you want to be. I know that your family will transform! Thank you, this is what I need right now. Our family is going through a lot and it has been very stressful. I know that anger is a secondary emotion and I think I am avoiding some issues because they are painful. Thank you. Yes, anger is usually a secondary emotion and stress can exacerbate it too. I hope that this handout helps you find some tricks to find the calm again. I’m sorry you’re feeling pain…it makes everything harder. Wonderful. This what I needed. Thanks. Am anxious to read and try it out. Thank you!! Great reminders, I’m a mother of three and sometimes we forget. I recently made a reward chart for my kids with happy faces if they do kind things and don’t argue. I put myself on it too, to remind me not to yell. I am a grandmother who retired at 58 years old to babysit our granddaughter (M) full time. She will be two in less than a month. Since her parents get home late from work it is a long day for me. I sometimes find myself losing my cool and yelling at M. She is very independent and it can be a struggle. Would you suggest your course or is it just for moms? I think this course is for anyone that has a child in their care. Whether you are a Mom (You are if you are a Grandmother..) or a child care provider. So take this course, read the literature and make a change. It is very helpful. I too have a past of yelling at my children (7 of them ages 2 and up!) and have been reading this and finding it does help. I have to read it every day and practice it. That is what life is all about. Practice. So good luck with your 2 yr old Granddaughter! Thank you for these tips!! I’m a mom of 3, soon to be 4 (! ), and I think this needs to be posted in a prominent place in my kitchen so I see it all the time!!! But why is the cycle so obvious, yet so hard to identify in the moment? Tension builds, kids (3-5yrs) do exactly the same thing they did yesterday to push my buttons, and I’m yelling, yet again. I’m a smart person. Why am I not doing better each time my kids and I have an “episode”? It’s like there’s no retention. Wouldn’t I eventually say “Hmmm. This looks familiar – tantrum, negotiating, just plain not listening. You’re smarter than this. Don’t get angry at this silly stuff, again.” But, I don’t. I yell and scream, recover and feel like I was having an out of body experience wondering why I can’t get a handle on this. Help! This is excellent, Amanda. I’ve just been compiling a list of my favorite stress resets and found you! I appreciate the support and ideas. I’m a single mother of one and I’m a yeller. I suffer from anxiety and it stresses me out, big time. It’s challenging at times, I’m not the perfect mom. I didn’t know what to do when my son would throw a fit or when he would get into things he’s not supposed to, but then again, I remember, he’s too young to understand. “Move”; I’ll put on some happy music, pick up my son and dance with him. His smile makes me so happy and it calms me down. Or, I clean. Cleaning keeps my mind busy and I stay focused on it until I’m done. “Get it out”, I’ll sing to my son, he smiles so big when I sing to him, (I may not be the best singer, but hey, he likes it) and it fills my heart with joy!